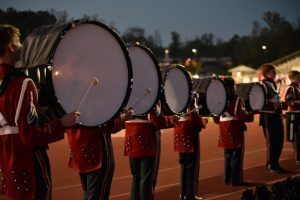 The Oak Mountain High School Percussion Ensemble has an annual membership of 10 to 15 students each year, consisting of the finest percussion players at OMHS. The ensemble meets daily during the school schedule and, under the direction of Kevin Ownby, performs music covering a large spectrum from the percussive repertoire. The OMHS Percussion Ensemble has placed first in the high school percussion ensemble competition at the Percussive Arts Society’s International Convention. They were later invited to perform as a featured ensemble at PASIC in 2007, and are the only high school ensemble from Alabama to ever earn this honor. In 2016, they were invited to perform at the Sandy Feldstein National Percussion Festival in Indianapolis, Indiana. They have also performed on three separate occasions at the Alabama Percussive Art’s Society’s Day of Percussion and twice at the Samford Percussion Ensemble Festival. The majority of students enrolled in this group take private lessons and members have consistently placed in the Alabama All-State Bands since the program’s inception in 1999.